2017 Weingut Korrell Johanneshof, Riesling Trocken “Von den Grossen Lagen” Nahe Germany. The beautifully steely crisp Von den Grossen Lagen Riesling Trocken by Weingut Korrell is a striking and complex wine that absolutely thrills in the glass with layers of tangerine, apricot, kumquat and quince fruits this is supported by smoky wet shale, rose oil, lime blossoms, verbena, saline, red tea spices, leesy almost caramel like textures as well as bone dry extract that makes this wine so wonderfully structured and with an underlying power. Even in it’s youth this fabulous pale limpid yellow/golden Riesling, which delivers graceful transparency, a subtle perfume and vivid energy, drinks with sublime form and elegance and of course there is the intensity and tension of the vibrant and racy acidity that provides the showcase for everything that is great in this fantastically crafted wine. It’s very exciting time for this small Nahe producer, as they just received one of Germany’s top prizes for this wine, taking the famous Riesling Cup! Winemaker, Martin Korrell adds that, the German Riesling Cup is perhaps the most recognized Wine prize in the German wine scene – with a blind tasting of more than 800 Rieslings and a participation of all top wineries. Wine legends like Doennhoff, Schäfer Fröhlich or Wittmann won this contest in the last years – and last Saturday we got the honor to be the winner of 2018. It was selected as the best by a jury of experts – sommeliers, journalists and oenologists. I extend my congratulations to Martin & Britta Korrell on this awesome win, and it certainly gave me food for thought as I was preparing to taste/review this wine, let’s just say it really whet my appetite to try it! And it does not disappoint with it’s class and depth it is without question a fantastic dry Riesling. Coming off four Grand Cru parcels, hence the name Von den Grossen Lagen (from the Grand Cru vineyards) this exceptional dry Riesling has it all, showing the Nahe’s great mix of soils in one wine, even though it is mostly marked by the volcanic influence. Martin Korrell blended this 2017 version from 34% Schlossbockelheimer in den Felsen, a vineyard you might have heard off being a site that Donnhoff uses in one of their own great Grosses Gewachs, 16% Schlossbockelheimer Konigfels, which is on porphyritic (volcanic) soils, 42% Norheimer Kirschheck, again a vineyard known for some of the best Spatlese from Donnhoff and set on intense slate soils, and 8% from an ultra steep parcel at Niederhauser Klamm known for it’s driving minerallity. Fermentations, with all four of the single sites done separately, the Norheimer Kirschheck begins as always with native and it is fermented in oak barrel, while the 3 other ones are done using more classical methods with special yeasts in steel tanks with cool ferments with all the wines seeing more than six months on the lees. 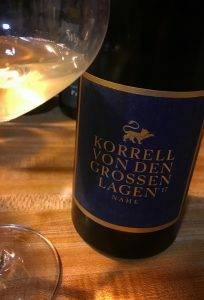 I am so grateful for the efforts of Britta and Martin to get me this Von den Grossen Lagen to try, the Korrell’s are rising stars in the Nahe and I hope to visit them on my next trip to Germany, they make a full lineup of wines, including a set of dry Rieslings with this one and their monopole Paradies, along with what I hear is an amazing Sekt as well as off dry and fruitier styles. This is a winery of note that is currently looking for an importer for the US market, and after tasting this intriguing wine I hope it becomes more widely available!